Female-fronted Brooklyn-based, dark electro band The Sedona Effect put on two screenings of their newly-released (January 2014) music video “Cross the Line” at the R Bar on Manhattan’s Bowery on a recent Thursday night to a large crowd of black-attired, dark wave fans. This band is the solo project of German-born, classically-trained soprano and dramatist Kai Irina Hahn who has recently come to NYC from London where, it can assumed, some of her conversion from lyric opera to EBM and industrial developed. The video features a mesmerizing, layered electro-industrial track that builds through several crescendos. On screen are Kai, in the form of a femme fatale — alternately bathed in eerie, blue and red light — and in the background phantom-like, masked and fetish-clad characters. Kai hisses her call to “cross the line.” During a black-&-white segment she holds the blade of a knife to the throat of a lethargic young male and succeeds in seducing him into final action. 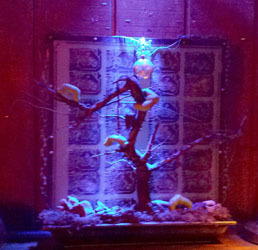 A large and slithering, spotted snake weaves its way throughout the video, bridging between several scenes, reminiscent of the serpent in the Garden of Eden. So —come to think of it — is Kai herself! Just the kind of thing to awaken the amoral side of the poetic persona. 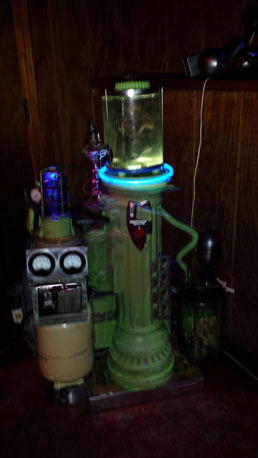 Parts of the video were actually shot at the RBar. Besides the video, there were live stage performances featuring duets of performers, the first a “Celtic Kabuki” with Duchess Wendi and Sean Monistat who wore a deer-antler helmet. The second featured Ess Moonking and Kai herself performing parts of the choreography of “Gloomy Sunday,” a cabaret piece that she staged last year at Bizarre Bushwick in Brooklyn where Kai now resides. 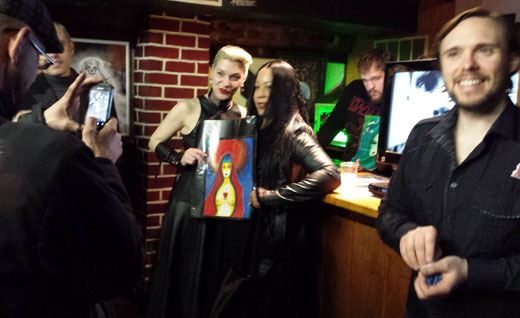 A pair of very interesting photo exhibits was held as backdrop to the video release party. 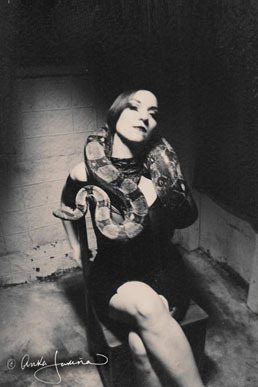 Anka Jurena’s work was largely b & w and quite creepy, and it included some available prints of Kai intertwined with her snake. Jesse Kleitman’s photography display featured traditional subjects, colors, filters and Photoshop enhancements. The turnout was excellent and the video was well received, which portends an even more successful launch of The Sedona Effect’s upcoming album “Vortices,” due out in the fall of 2014.